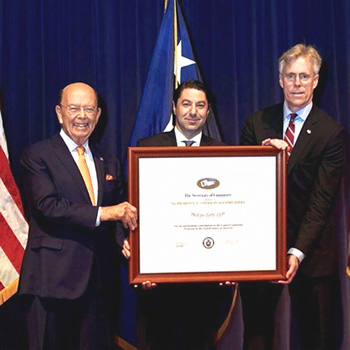 Buffalo, N.Y. – U.S. Secretary of Commerce Wilbur Ross today presented Phillips Lytle LLP with the President’s “E” Award for Export Service at a ceremony in Washington, D.C. The President’s “E” Award is the highest recognition any U.S. entity can receive for making a significant contribution to the expansion of U.S. exports. Phillips Lytle LLP, with offices across New York State, Washington, D.C., and Canada, is a provider of export services for small and medium-sized U.S. businesses, including compliance counseling, joint ventures, recapitalization/restructuring, international tax issues, mergers and acquisitions, intellectual property, entity formation, and more. 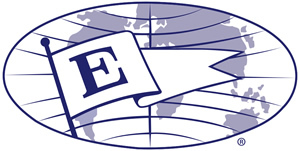 Phillips Lytle is one of nine companies to receive the President’s “E” Award for Export Service. In total, Secretary Ross honored 43 U.S. companies and organizations from across the country with the President’s “E” Award for their role in strengthening the U.S. economy by sharing American ingenuity outside of our borders.